One of the infants being taken into Mater Dei Hospital this afternoon. Photo by Darrin Zammit Lupi. 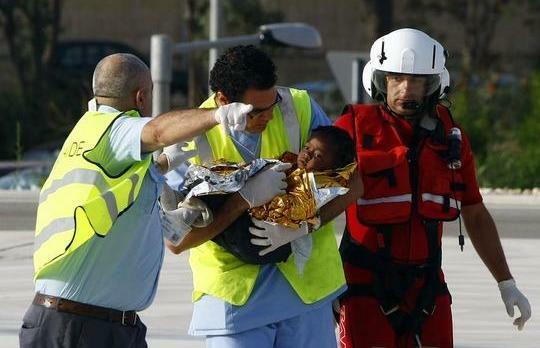 Two infants were ferried to Mater Dei Hospital in an AFM helicopter this afternoon after a migrants' boat capsized 60 miles south of Malta. A woman believed to be their mother died moments before a German rescue helicopter arrived to also airlift her to Malta. The migrants were plucked out of the water by the crew of patrol boat P52. The other members of the group - 20 men and seven women - are being brought to Malta. The German Puma helicopter is in Malta for Frontex operations.